December 1927: he makes his first appearance on stage at the Ichimuraza, receiving the name of Ôtani Hirotarô I. March 1948: Ôtani Hirotarô I becomes Ôtani Tomoemon VII at the Tôkyô Gekijô, playing in the drama "Suma Miyako Genpei no Tsutsuji". May 1949: premiere at the Tôkyô Gekijô of the dance-drama "Higaki"; Tomoemon plays the role of Ono no Komachi [casting]. December 1949: Chikamatsu Monzaemon's drama "Ikutama Shinjû" is revived at the Mitsukoshi Gekijô, using a new script written by Uno Nobuo; Tomoemon plays the role of Kashiwaya Osaga [more details]. 1952: Tomoemon plays the role of Gohei in Naruse Mikio's movie "Okuni to Gohei"; the role of Okuni is played by the actress Kogure Michiyo. 1954: Tomoemon plays the role of Dr. Motaba in Mizoguchi Kenji's movie "Uwasa no Onna" ("A Woman of Rumour"); his movie partner is the famous actress Tanaka Kinuyo. March 1958: Tomoemon takes part in the final Kabuki performance at the Ôsaka Kabukiza [more details]. November 1962: revival at the Kabukiza of the drama "Fudô", which belongs to the Kabuki Jûhachiban; Tomoemon plays the role of Chitoseya Miyoshino [more details]. June 1963: premiere at the Kabukiza of Hagiwara Yukio's Nagauta-based dance-drama "Ôeyama Shuten Dôji"; Tomoemon plays the role of Lady Wakasa [casting]. September 1964: Ôtani Tomoemon VII takes the name of Nakamura Jakuemon IV at the Kabukiza, playing the roles of Princess Yuki, Omiwa and Matsutarô's wife in the plays "Kinkakuji", "Mikasayama Goten" and "Hitoyo"; in "Kinkakuji", he performs in ningyôburi style (the puppeteer is Iwai Hanshirô X) and his stage partners in the roles of Matsunaga Daizen and Konoshita Tôkichi are Onoe Shôroku II and Ichikawa Jukai III; in "Mikasayama Goten", the new Jakuemon shares the stage with Onoe Shôroku II (Fukashichi, in reality Kanawa Gorô Imakuni), Bandô Mitsugorô VIII (Soga no Iruka), Morita Kan'ya XIV (Motome) and Nakamura Senjaku II (Princess Tachibana). June 1965: Nakamura Jakuemon IV, Ichikawa Ennosuke III, Sawamura Tanosuke VI and Ichimura Takenojô VI celebrate their shûmei in Ôsaka at the Ôsaka Shinkabukiza; Jakuemon plays the roles of the shirabyôshi Hanako, Shizuka Gozen and Princess Yaegaki in "Musume Dôjôji", "Kawatsura Hôgen Yakata" and "Jusshukô"/"Kitsunebi"; his stage partners in "Jusshukô" are Kataoka Nizaemon XIII (Katsuyori), Sawamura Tanosuke VI (Nureginu), Arashi Kichisaburô VII (Nagao Kenshin), Ichimura Takenojô VI (Shirasuga Rokurô) and Onoe Kikujirô IV (Hara Kobunji); in "Kitsunebi", Princess Yaegaki is performed in ningyôburi style (the puppeteer is Kataoka Nizaemon XIII). November 1966: opening ceremony of the National Theatre in Tôkyô with the full length performance of the classic "Sugawara Denju Tenarai Kagami"; Jakuemon plays the roles of Tatsuta no Mae and Yae [casting]. December 1966: second month of the opening ceremony of the National Theatre with the full length performance of the classic "Sugawara Denju Tenarai Kagami"; Jakuemon plays the role of Yae [casting]. March 1967: revival at the National Theatre of Tsuruya Nanboku IV's masterpiece "Sakura Hime Azuma Bunshô", which is supervised by Gunji Masakatsu; Jakuemon plays the roles of Princess Sakura and Fûrin Ohime [casting]. April 1976: revival in 5 acts and 9 scenes at the National Theatre of Namiki Gohei I's drama "Kinmon Gosan no Kiri"; Jakuemon plays the roles of Sonoo-no-Kata and Oritsu [casting]. January 1983: revival of "Nanatsu Men" at the National Theatre; Jakuemon plays the role of the keisei Akoya [casting]. January 1984: historic revival at the National Theatre of the play "Sankai Nagoya"; Jakuemon plays the role of the courtesan Katsuragi [casting]. January 1985: revival at the National Theatre of the drama "Kan U", which belongs to the Kabuki Jûhachiban; Jakuemon plays the role of shirabyôshi Manju, in reality the keisei Akoya, later the concubine Ô Bijin [casting]. 1991: Jakuemon receives the prestigious title of Living National Treasure (Ningen Kokuhô in Japanese). 15 December 1992: Jakuemon joins the prestigious Japan Art Academy (Nihon Geijutsuin). November 2002: the Kabukiza commemorates the 74th anniversary (75th memorial service) of the passing away of Nakamura Jakuemon III; Jakuemon plays the prestigious role of Princess Princess Yaegaki in the drama "Jusshukô". He is supported by an all-star ensemble: Onoe Kikugorô (Katsuyori), Nakamura Shikan (Nureginu), Nakamura Tomijûrô (Nagao Kenshin), Ichikawa Danjûrô (Shirasuga Rokurô) and Kataoka Nizaemon (Hara Kobunji). January 2008: Jakuemon plays at the Kabukiza the role of the keisei Ishikawaya Masagoji in the drama "Onna Goemon"; the role of Mashiba Hisayoshi is played by Nakamura Kichiemon. February 2008: Jakuemon takes part in the kôjô which is staged at the Kabukiza to commemorate the 26th anniversary (27th memorial service) of the passing away of his late father-in-law Matsumoto Hakuô. January 2010: Jakuemon appears on stage for the last time, at the Kabukiza, where he plays the role of the empress in the festive dance "Haru no Kotobuki", which is staged to launch the final few months of performances at the Kabukiza before it closes for rebuilding. Jakuemon being too frail, he dances only the 19th. He is replaced by Nakamura Kaishun the others days. 23 February 2012: Jakuemon passed away from pneumonia at St. Luke's International Hospital in Tôkyô. Living National Treasure Nakamura Jakuemon IV was an amazing onnagata actor who played all the most difficult princesses and courtesans roles of the Kabuki repertoire. His favourite roles were Agemaki ("Sukeroku"), Chiyo ("Terakoya"), the shirabyôshi Hanako ("Musume Dôjôji"), Hanjo-no-Mae ("Sumidagawa"), Izayoi ("Izayoi Seishin"), Kasane ("Kasane"), Matsuyama ("Ninin Wankyû"), Okaru ("Chûshingura"), Omiwa ("Imoseyama"), Onoe ("Kagamiyama"), Otatsu ("Natsu Matsuri"), Otoku ("Domo Mata"), Otomi ("Kirare Yosa"), Sagami ("Kumagai Jin'ya"), Princess Taema ("Narukami"), Takiyasha ("Masakado"), Princess Toki ("Kamakura Sandaiki"), Umegawa ("Koi Bikyaku"), Princess Yaegaki ("Honchô Nijûshikô"), Yatsuhashi ("Kagotsurube") and Princess Yuki ("Kinkakuji"). 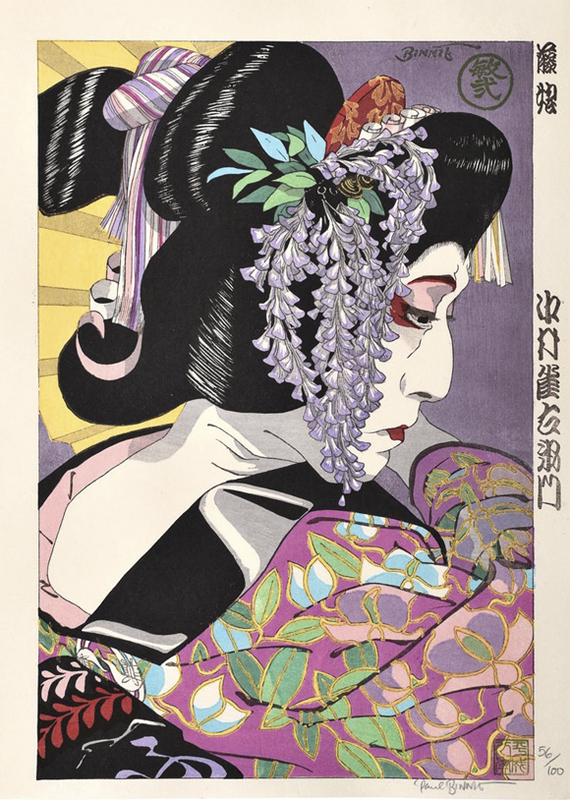 Nakamura Jakuemon playing the role of the Wisteria Maiden in the dance "Fuji Musume"